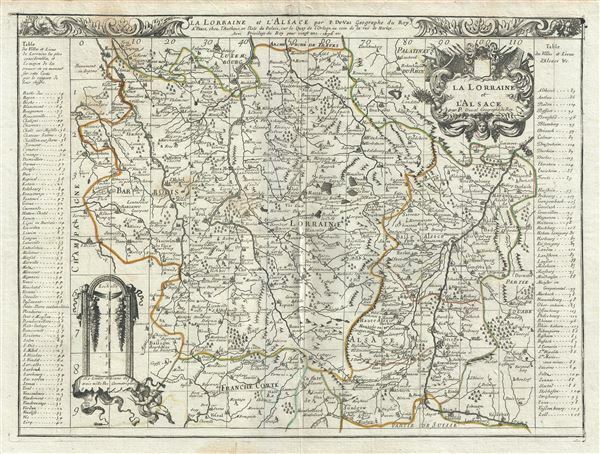 This is a beautiful 1676 map of the French wine making region of Lorraine and Alsace by Pierre Du Val. It covers the north east portion of France along with parts of neighboring Germany and Luxemburg from Luxemburg City south as far as Basel, Switzerland and from Saint-Dizier, France east to Baden-Baden, Germany. The map renders the entire region in extraordinary detail offering both topographical and political information with cities, mountains and forests beautifully rendered in profile. This region, which traded hands several times between France and Germany, is known for its exceptional cuisine, wines, and unique culture. Alsace is known for its fine white wines and along with Austria and Germany, this region produces the world's most desirable dry Rieslings. This mountainous area of the Alsace wine region and is known for its production of both Pinot Noir and Pinot Gris. The region surrounding Strasbourg on the west bank of the Rhine River is known for producing Munster cheese. A key to the towns in included on both sides of the map proper. A beautiful title cartouche adorns the top right quadrant of the map, while another cartouche in the lower left quadrant features the scale. The top border is also beautifully decorated. This map was created by Pierre Du Val in 1676. Pierre Du Val (May 19, 1619 – September 29, 1683) was a French cartographer and publisher active in Paris during the middle part of the 17th century. He was born Abbeville, Picardie, France, where his father, also Pierre, was a merchant, consul, and alderman. His mother was Marie Sanson, sister of Nicolas Sanson d'Abbeville (1600-1667), the leading French cartographer of his day. Du Val and probably apprenticed in Sanson's workshops. Afterwards, in Paris, he studied geography under Jean-Baptiste Gault, who later became the Bishop of Marseilles. He counseled M. Henri of Savoye, abbot of St. Sorlin, and M. Gilles Bouraut, bishop of Aire and later Evreux, in matters of science and geography. Du Val became Geographe ordinaire to Louis XIV in 1650. His first atlas, the 1654 Cartes Geographiques Methodiquement Divisees, contained few of his own maps and was mostly compiled from reissues of maps by other cartographers. His early work focused on atlases and geographical treatises, but later, he turned his attentions to large separate issue, often multi-sheet maps. After his death in 1683, his widow, Marie Desmaretz, continued his business at least until 1684, after which it passed to his daughters (either Marie-Angelique or Michelle), who published until at least 1688. Very good. Minor wear and verso reinforcement along original centerfold. Some foxing in upper left quadrant and lower margin. Minor offsetting.